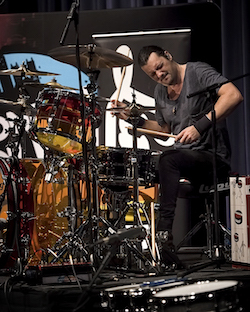 Not often have I met a drummer who has such an extensive and diverse biography: music education, orchestral percussion, jazz, pop, musical theatre, producer, actor, arranger, clinician, art consultant… Jason Sutter can do it all. 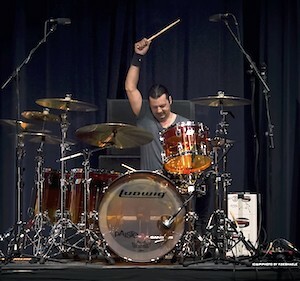 On top of that he’s one of the most in demand rock drummers America has to offer, having worked for the likes of Foreigner, Marilyn Manson, New York Dolls, Chris Cornell and many, many others. How did it all start? 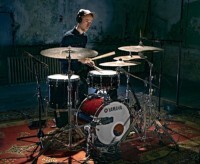 Why drums? I got hooked by Frankie Lymon And The Teenagers. It was my first vinyl record and I loved it. From there I got into Kiss and Cheap Trick and I just suddenly gravitated towards drums. My dad was really into playing drums when he was little. He wanted to become a drummer but his father didn’t let him, so he became a sculptor. 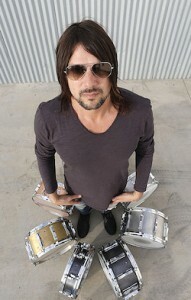 He loved that I got interested and went out and bought me a 60s Ludwig kit, that’s how I started. I lived in a College town and all the professors kids played instruments. We started getting together to pretend to play, like fake jamming to Eagles and Kiss records. Eventually we actually started playing, I took lessons, we formed a band called Paragon and we actually started got gig. The first gig I ever played I got paid $2 to play a dance. My dad still has that framed somewhere. 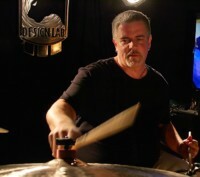 The college had a great drum teacher called Jim Petercsak who actually used to teach Vinnie Colaiuta and Dave Weckl. At that time I didn’t know that of course but I was very lucky to have his tutorage at a young age. The town was a great cross section of pop and rock bands and I was something like a young session drummer. I was playing for four different bands, some original bands some cover bands, and all of them were gigging at bars, beer blasts and all kinds of parties. I was getting a very good cross section of performing experience and real life scenarios at a young age. So was making it a career always the plan? Always. By the time I was in senior high school I knew I was gonna go to music school. I also knew I was gonna get a Masters degree, that was a promise I made to my dad. That way I knew I would always have a career of some form or another. So yeah, that was really on. By the time I was leaving high school I knew I was gonna do that. If all went well, wouldn’t it be amazing if I got a gig and get paid for it or sign a record deal… And here I am, still going. You did your Bachelor in music education. Has teaching always been a passion? Not necessarily. I think it was the smartest and all-round degree I could do and I could take all courses in literature and mathematics so I knew I whatever happened I always had a core degree. I would get the most for my money and cover most ground. It also was a very strong degree to graduate with because I could use it in education or performance. And then a Master in orchestral percussion? Yes, at that point I thought I could do something that would be a little more performance orientated. I thought those two degrees from these two colleges I could be the strongest I could be. Now you’re one of the most in demand rock drummers, that’s a completely different side of the business. Yeah, I was playing Timpani in the wind ensemble, I was a graduate assistant for the band department and I was the instructor of a 40 piece drum line of the Miami Hurricanes who were one of the top football teams in the world at that time. We were flying to games on jets, were sponsored by Nike, and even Vic Firth was checking us out. It was really cool to be in such a big position and I got a lot of teaching experience out of it. I was also playing in the college jazz band (CJB) which is a top big band, all Maynard Ferguson players. Dante Luciani, Roger Ingram (who went on to play with Wynton Marsalis) – these guys were at college when I was there. Pat Metheny came down and played with the big band multiple times. It was an incredible experience. I wasn’t just studying, I was in the band department, the orchestra, the wind-ensemble, I was conducting all the percussion ensembles as a Professor, playing in the jazz band, in a jazz vocal ensemble working on brushes and so on. Towards the end of the MA I got a job offer and went for an audition in Boston for a rock artist called Juliana Hatfield, I got the gig and that took me away. I had to come back to do my Masters recital which is all I had left to do luckily. That was it. I got the degree, went back to Boston to play rock. So has rock always been a passion anyway? It was, yes, and I knew that at the time rock’n’roll was at an all time high. Getting out of college in ’95 I was in the middle of the grunge era and then rock’n’roll got a resurgence with metal, New Metal and Classic Rock became cool again. This all happened right as I was hitting the ground. Now there is less of the rock bands and its more pop but I was very lucky to hit that point at that time. I’ve done it and now I feel like I’d like to do anything else. I’d love to play some country, do a pop gig and I’d love to get back and do some jazz stuff and maybe take a little more liberty being creative. I’ve earned that rock title I guess and it’s something I’ve always wanted to do, but now I’d like to do something else. You have done a lot of pop recording though, right? Yes, I’ve recorded with Pink. That was amazing. Couple of the tracks made the record. I did some stuff with Babyface for the movie soundtrack to Josie and the Pussycats. I’ve done some touring with The Rembrandts, that was cool. So yeah, I’ve done some pop stuff before. You were in the original cast of the musical Rock Of Ages? I was. I actually arranged all the music with a guy called Dave Gibbs who was the musical director. We had actually been to high school together and played Grease together back then (Dave on guitar) because we were the only two guys who could read. From there I actually got hired from all these high schools nearby. Our town was quite well known for being a theatre orientated college town so people came from all over to see the show. They dug the rhythm section so much they hired us, so we ended up driving all over the place at a young age to join these shows. It was kind of my first session work. Years later Dave called me and told me he got the offer to work on a new show and he wants me on board. I was bought in, we arranged all the songs and I ended up playing in the first production. At the beginning we did a months worth of previews in a bar. Those were one hour long shows in front of about 100 people each show. They brought in producers from all over the world. It was bought, they wrote a second act to elongate it and I was hired to be one of the musicians. We played it for four months during which time I got the gig with Smash Mouth. The show went on to Vegas and then off-broadway to New York but I could never do it as I was too busy with other gigs. It then went to Broadway and on opening night I get a call from Dave going: “Where are you? I just want to let you know we have opening night.” I happened to be in NY on Times Square playing Letterman just up the road. I walked down the street, went in, sat next to Dave and watched the premiere. It ended up winning Tony’s and being one of the longest lasting shows on Broadway. Yes, I did Chris Cornell’s solo project right after Audioslave ended. There was an extensive audition of 30-40 guys but they couldn’t find anybody so they called me in. They offered me the gig on the spot but I turned it down because I was still playing with Smash Mouth. They asked me to keep coming into rehearsals and it eventually became obvious that I’d have to do it. We did three years, a lot of Europe and UK. It was amazing! Foreigner came shortly after. I did a Vertical Horizon tour for two months and when I got home I did a doubles tennis match with the guitarist from Cornell, a bass player and the keys player of Foreigner. I always wanted to play with a big classic rock band so while we were hanging out I just told him that if the gig ever opened up, I would love to do it. He called me a bunch and I was hoping it would be for the gig, but it was always because he wanted to go for coffee. Then I was sitting at NAMM two months later and he called me to say that Brian Tichy was leaving and that he had put my name forward. “Start learning Foreigner tunes, there’s gonna be an audition”. I was actually sitting with a bunch of great drummers at the Paiste party and when the phone rang I was jokingly saying: “Oh it’s the keys player for Foreigner, maybe he’s calling to offer me the gig.” And he did. Life is weird. After that I got a call from Brian Delaney, the drummer for New York Dolls. He knew I had always been a huge fan of the band and made sure I saw them whenever I could. He was going to have a baby and the band was about to go on tour with Mötley Crüe and Poison. I was a huge fan of both those bands when growing up. They had seen me playing with Chris Cornell a few times so they were happy to have me on board. I made sure they knew I was from New York even though I lived in LA. From the first day of rehearsal I really felt like being part of the gang, it was amazing! My nickname was Hollywood. It was a killer band and I was probably 20 years younger than the next guy and they treated me with great respect. It was incredible for me. 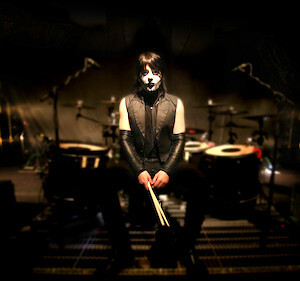 From one rock legend to the next: you were touring with Marilyn Manson? That must have been an experience! I did Manson for two years from 2012 which was incredible. Amazing chance to get to fulfil that rock/metal element I always wanted. 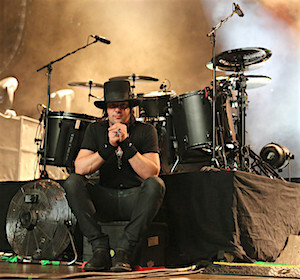 I was at these festivals sitting behind Dave Lombardo, Vinnie Paul and Joey Jordison – the best. It was just this epic rock world to be involved in travelling all over the world for two years. I got to play on the only real drum track on the record Born Villain which is cool and did the Hey Cruel World tour with Rob Zombie. We went everywhere man, it was incredible. Right as that was ending I got a call from Smash Mouth and went out with them for almost three years; even produced their last record. And then I got a call from a guy called Tak Matsumoto, a Japanese artist, that was my most recent gig. It was really cool because I was the only non-Japanese guy dude on the gig and I even ended up going to Japan living there which was always a dream. The whole band is just amazing, it’s all instrumental and Tak is Grammy award winning. We toured Japan, played on his most recent record ‘The Voyage’ too and there is a Live at Budokan DVD that just came out too. Not only did I get to play the Budokan but I got to play it with an incredible instrumental band and there is a DVD to prove it. It’s absolutely incredible, a dream come true. All these artists, all these genres. Is that the key to success? I think the key is just trying to stay current. trying to push yourself, be diverse. be able to adapt and just want to play different styles of music. I want to, I would never be happy just playing in one band. Sure it would be great to have the financial stability and there is something about that. For examples I’m just coming of this seven country, 15 clinic tour of Europe and those clinics are completely new for me. It’s fun to get out there and kind of show the big picture and what a great chance to really get the boots on the ground and get to meet all these drummers and exchange ideas, hang and represent my companies. Having all these companies back me up and have the faith in me is a big deal, so I’m trying to get back to Europe more to do more of that. Also I want to bring to music schools the idea of education in the big picture: the fact that I went out and did this, I was sitting in your chair. I don’t just wanna give the big picture to drummers but teach the whole music department about the business of music. Playing on all those different gigs I’ve been fortunate to get a lot of different perspectives. From that I was able to compile kind of a syllabus I can bring to those students and hopefully show them the wider picture because in College you don’t get that. That sounds great. So is the clinic side of things something you want to pursue more? You started producing as well? Yes, I got to produce the Smash Mouth record. It all started by me producing a studio track, a cover of a Kinks song. They loved what I did so I asked them to give me a crack at some of the live tracks. I took recordings from a live show in South Dakota and a couple of tracks from a gig in Manila, went into the studio, got a mixer, did the edits, got my hands full on and really shaped it. They liked it and asked me to do the whole record: Smash Mouth Greatest Hits Live. You can find it out there now. It’s sounds killer man, I’m really proud of it. It’s just another whole thing – and the whole live and studio element to it was really exciting. Talking about ‘yet another thing’, we can even find you on the worlds big cinema screens? Yes, I ended up landing a role with Steven Spielberg for Stanley Kubricks last film called A.I. Jude Law and Hayley Joel Osment were in it and I was on set for three weeks in Long Beach. It was an incredible experience. Even though I was mostly playing drums, I was hired as an actor and thereby gained a whole lot of respect for what actors go through. It landed on the desk of the guy who was managing me and I got it because of experience I had teaching the Blue Man Group. You were teaching the Blue Man Group? Yes, I was teaching one of the Blue Man Group privately in Boston. He said: Wow man, you have all this drumline experience and we need someone to get all these actors to drum. So when all the actors came in they sent them to Boston and I would show up and teach a giant crude drumline of Blue Man. Is there any space for non music related activities? Yes, I collect art and help other people build their art collection. I’ve been hired by a very famous photographer to be an art consultant in Los Angeles and I’m trying to do more of that. I also help galleries build their portfolio and have worked with a new gallery that just opened in Minneapolis. I’ve done that for years with many different clients and it’s fascinating. My father was a sculptor and taught at the Royal Academy of Art here in London so art has always been around and it’s a real passion for me. What am I doing next? I’m actually doing a Chris Cornell tribute with all his band in LA. We’re all getting together and have four or five different singers joining us for a big show in December. Then I’m doing a jazz record with the jazz faculty from the University of Texas et El Paso in January and February. I’m really excited to get to go down there and actually do some jazz stuff, get that out there and maybe get some photos and videos out to show that side which I haven’t really pursued yet. It’s exciting. I’m also trying to keep the education thing going as well as whatever gig is next. That’s the beauty and the thrill of it. Whatever is next is next. Thanks a lot for your time Jason!